The following notes are taken from the liner notes of the CDs "Alberto Ginastera: complete works for piano" produced by Fundacion Ostinato. All notes are the property of Ostinato. Partial or total reproduction prohibited. DANZAS ARGENTINAS OP. 2 (1937). 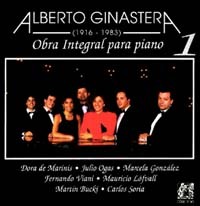 This is Ginastera's first piano work, highly influenced by Argentine musical nationalism of the 1880 Generation (Alberto Williams, Julián Aguirre). Even so, the pieces show the composer's personal style in dealing with folk elements. Vital rhythms, use of polytonality in certain sections -like the first theme of Dance of the Wild Gaucho-, expressive dissonances and virtuoso passages demanding a "tocco quasi martellatto" are some of the devices later developed by the composer in most of his works. W e can also find two typical features of Ginastera's work, the obsessive-rhythmic element -Dances No 1 and No 3- with long passages based upon an only rhythmic pattern, and the calm, poetic one -Dance No 2- with a prevailing melodic inspiration. And, last but not least, the folk element typical of all of his compositions, thus making of each of the works an artistic creation with folk references and not a mere stylization of traditional pieces. 12 PRELUDIOS AMERICANOS OP. 12 (1944). These are twelve microforms featuring obsessive rhythms contrasting with static melodies and rhythms. Polytonal devices are widely used. Preludes Vl, Vlll, IX, and Xl are dedicated to composers from North and South America. They could be called "after ..." as Ginastera uses the language of the composer he pays homage to. Prelude X suggests Paul Hindemith's Pastorals, although the German composer's name is not mentioned. Preludes II, III, and IV are directly related to folk song and dances, while Prelud es V and Xll recreate the atmosphere of the Argentine Puna by using the pentatonic scale with no popular melodies or rhythms. Preludes I and Vll, related to technical, virtuosso aspects of the instrument, are probably among the most relevant piano pieces Ginastera ever composed. Publisher: Ricordi Americana, Buenos Aires. This is a literal transcription of "Cancion del arbol del olvido", from Two Songs op. 3. The original song, with words by Fernan Silva Valdes, was very popular, and the poem was supposed to be read by all elementary school students. As to the piece, we ca n talk about folk stylization, since the melody keeps its traditional form and rhythm, except for a few bars, although this does not affect its original function. At the time the piece was composed these innovations were thought of as a folk recreation bu t today -sixty years later- the piece can be considered a real popular creation. The Milonga is a good example of the important contribution by composers like Ginastera to Argentine popular music. In 1941 Lincoln Kirsten commissions Ginastera the ballet Estancia for Caravan Ballet. It was first performed eleven years later with great success in Argentina and the rest of the world, especially in the United States. This Ballet in one act and five scenes captures life in the Argentine countryside. The scenes are 1. Introduction and Scene, 2. Little Dance, 3. Wheat Dance, 4. Country Workers, 5. Workers in the hacienda, 6. Tourists, 7. Afternoon, 3. Rodeo, 9. Sunset romance, 10. Night song, 11. Morning, 12. Malambo. The music is greatly influenced by Igor Strawinsky and Bela Bartok, as are all works from Ginastera's objective nationalism period. The "Pequeña Danza" is a purely incidental piece, accurately transcribed in an effort to convey the orchestral to ne colors from the original, such as the "glissandi" in the first theme. SUITE DE DANZAS CRIOLLAS OP. 15 (1946). This is a transition work between Ginastera's first and second periods. A remarkable fact is the absence of names for each one of the pieces. In this work the composer starts to part with objective nationalism. He also shows to have achieved a full maste ry of the instrument. In this respect mention should be made of the delicate sonorities of the first, third, and fourth sections, the subtle polyrhythms and the Canon in the Allegretto Cantabile. The Scherzando and the Coda include a good part of the mate rial he would use in his First Sonata six years later. The Allegro Rustico -even though he uses clusters for the first time- is the section most related to Ginastera's previous works as it reminds us of Corrientes's "Gato", a typical dance of Argentine Mesopotamia. SONATA No. 1 OP. 22 (1952). This work was commissioned by Carnegie Institute and Pennsylvania College for Women.It is the composer's only piano piece related to Subjective Nationalism. In a symbolic musical language, folk and regional traits are melted in a highly universal work. The Sonata is cast in four movements, the first one of which is written in the classical sonata form. The opening theme, very primitive, is followed by a second theme full of expressive Iyricism, flexible, pastoral-like. The typical features are steady polytonal elements and highly complex rhythms. The second movement, presto misterioso, is a fleeting, vaporous three-part scherzo. 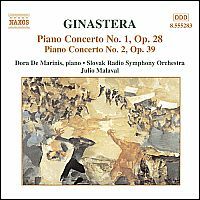 Ginastera uses a twelve-tone senes for the first part and the second one conveys the folk reminiscences of a malambo. The t hird movement, Adagio, is a three-part lied, while the fourth one, in rondo form with five sections, is reminiscent of the typical toccata writing. "The reception accorded my Piano Sonata No. 1, Op. 22, written in 1952, and the widespread popularity that it so quickly obtained, is perhaps the reason why so many years separate it from this, my Second Sonata, Op. 53, completed in 1981. In the interim I composed two piano concertos, but no works for piano solo. This works is in three movements. The first. Allegramente, has a main subject, a quasi introduction and conclusion, framing developments based of different dances and songs, among them the Argentinian "Palapala". The second movement, Adagio sereno- Scorevole-Ripresa dell' Adagio, has a nocturnal character. The first part is a "yaravi", a melancholy love song, of pentatonic pre-Columbian origin from Cuzco, with the characteristic vocal inflections of primitive civilizations. The Scorrevole, like a scherzo, evokes the murmurs of the night in the lonely Andean punas. The Ripresa dell' Adagio finishes this part, reduced and in dissolution, gets lost in the silence. The third movement, Ostinato aymara, takes the form of a toccata whose fundamental rhythm comes from a dance called 'karnavalito'. This part is solid and impetuous, as is characteristic of South American Music. I have dedicated this Sonata to my dear friends Dorothy and Mario di Bonaventura, who commissioned it many years ago." TRES PIEZAS, OP. 6 (1940). These are probably Ginastera's pieces most related to Argentine romantic nationalism. There are not only the rhythmic and armonic devices he begins to use in Op. 2 but a direct influence of the French school -a typical trait of most Argentine composers. In "Cuyana" we find a steady mayor-minor ambiguity, typical of Argentine folk music together with some romantic traits, such as use of chromatic harmonies, a steady flow of eighths in the left hand and added notes. "Norteña" suggests a "baguala" where a plaintful melody is heard upon an ostinato bass through a succession of 3/8 and 3/4s. The middle section is more according to the traditional piano style, with chords and arpeggi. After reaching the climax Ginastera slowly goes back to a slowly vanishing starting theme. There is a coincidence between the verses and the phrase at the beginning. This interlude and quoting the verses show the composer's suggesting a "danza con relaciones" (dance with variations), typical of Argentine folk music. Then follows a reexposition of the dance with a strong, vigorous finale full of glissandi - a device Ginastera is so fond of- and extremely demanding "sforzatissimo" or "fff" chords. The score is written in four staves as imitating the organ tone colors and power. Left hand octaves and tenths in the lower range against the melody in the treble are reminiscent of the organ pedals and the use of octaves with sixths and thirds imitate the organ stops. The starting "symbolic chord" -as Ginastera calls it reminding of the natural tuning of guitar strings- is a recurrent device in his works. The structure of the piece is in three sections with all rhythmic and harmonic elements of the dance. It also reminds of the competition aspect where each "gaucho" shows his skills. According to Ventura Lynch "this is a dance individually starting with a simple 'brushing', following some variations of increasing difficulty to end up showing the best of skills in the final heel tapping". This "program" can be applied to Ginastera's Malambo. The first section, with the repetition of the first subject (A) and the dynamic development of successive imitations going to the treble with the addition of more an more simultaneous sounds leads up to the second subject (B). The second section is more complex with its alternating themes, its "crescendo" leading up to "fortissimo", its virtuoso chromatic passage in the left hand and the second subject with a leaping melody. The third is an "ending up" section with its "sempre fortissimo" and the closing passage taken from the bass of the second subject. In this fresh, simple piece, Ginastera directly quotes popular nursery tunes dear to him through rhythmic and harmonic devices he creates for each. This is a very original work in the sense that the composer does not make use of any virtuoso devices nor does he alter the themes. On the contrary he tries to enhance the harmony inherent to each one of the melodies. This makes the Rondo a masterpiece of chromaticism with some Debussian traits like in "Palomita Ingrata" (Cheating Little Dove). This Sonata, commissioned by the University of Michigan, is Ginastera' s final work. This short piece, full of verve, written in a twelve- tone language, is cast in two main sections based upon two thematic elements. In the first one the composer uses Indian rhythms canonically elaborated, and in the second section he uses "chacarera" rhythms -a dance from the central region of Argentina. There are reminiscences of Spanish rhythms at the end of the second section. In the Coda we find elements of both the second theme and the Spanish rhythm, plus a clear-cut five-tone element with clusters repeated four times, somehow effaced by a crescendo and accellerando thus leading to a violent finale.